Last week, we drove down to SoCal to visit family and for me to race my final race of the season, Lifetime Tri Oceanside. While Challenge Rancho Cordova was a race I focused on for the end of the season, I felt like October 5 was too early to end racing for the year. I knew Oceanside would be a battle with very fast women, most fighting for series points, but I figured I could try capture a bit of “speed” after RC and see if I could get close to, or under, 2:05. The race only paid five deep and with the field assembled I knew finishing in the money was probably not going to happen unless “race day magic” lined up perfectly and my body absorbed lots of speed quickly. I am not saying this to be negative or count myself out; it is more my respect for how fast these women race. Throughout the years the depth and strength of the professional women has grown in leaps and bounds. Due to this depth, I think it is difficult to switch up race distances and compete at quite the same level. The racing, and subsequent training, is requiring more specialization in the distance. Plus, as an “older” athlete, my strength lies in the longer/slow burn type of racing vs. the explosive type of racing you need for the Olympic distance. I am faster than I used to be at the shorter distance, but I think this improvement has come more from getting stronger overall instead of developing more speed. All that said, I came into the race relaxed and ready to give a hard effort on the day and see what I could do. The surprise of the weekend—a non wetsuit swim! The water was even warmer than Rancho at 70.9°. As a swimmer, non wetsuit is usually good. As someone who freezes while snorkeling in the Grand Cayman I was less than thrilled. I opted to warm up only on land with a run and stretch cord work for the arms. 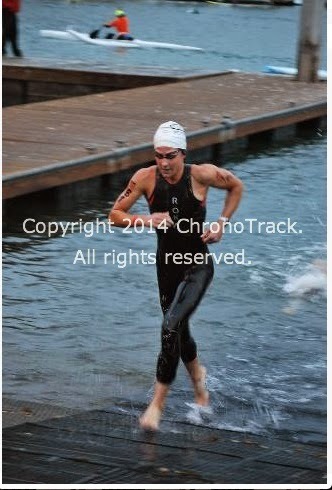 I got into the water at the very last second and sprinted out to the line to finish off my warm up. The beginning of the swim was crowded but I forced myself to deal with the contact instead of shying away from it like I usually do. I ended up pretty much alone, 15 meters behind Mary Beth Ellis with the main pack up ahead. I felt pretty good but, true to form, started to get cold towards the end of the swim. However, it was not nearly as bad as RC and I did not even get crabby about being in the water so I must not have been terribly cold! I hopped on my bike with a good group to ride with but had an issue with my left shoe and it left me on the side of the road putting my shoe on and dropping my chain because I stopped to quickly. The dropping chain thing was weird, I still have not figured out exactly how that happened…. Either way, I was quickly passed by everyone in the field and spent the rest of the bike chasing. I felt pretty good but when you give those aforementioned fast women time it is pretty hard to make up! My mindset flip flopped between motivated and extremely irritated with myself for a dumb mistake. However, since it was the last big race effort of the year I rode hard and tried to do what I could. The run was much of the same—alternating between questioning why the heck I decided to do this race and motivated to see if I could catch anyone ahead. In the end, I held my position with a hard charging Bec Wassner chasing from behind. 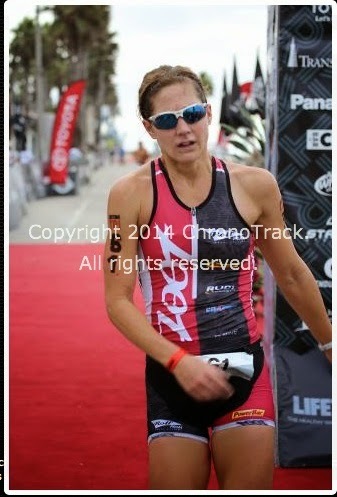 I have to thank Bec for that….she got me in gear the last mile and I finished hard. In the end I went 2:06:15, not too far off my 2:05 goal and a PR for the distance. At first, I was disappointed and annoyed with myself for what I viewed as a lack of focus on the finer points during the race. I cost myself some time and, in my head, blew an opportunity to go faster than 2:06. Upon reflection, it was close to what I had been aiming for and creates motivation for improvements to be made in the off season. However, I think I will stick with focusing on the half distance! Patrick Kelly: My coach since 2007. I don’t think he anticipated all this the first time he saw me race at the New Balance Half in Victoria. My sponsors: Joe, Sherpa, Mike and everyone at Davis Wheelworks, Gotts Roadside, Powerbar, Rolf Prima, Roka, Rudy Project (especially with the last minute helmet delivery!) and Zoot. Andy: He puts up with my training, early bedtimes and everything else that makes me extremely square—all because he knows how much I love it.